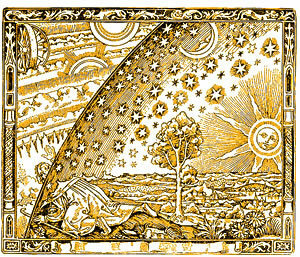 | Copernicus Was Wrong : Reconstructionism & "The Flat Earth Temptation"
Copernicus Was Wrong : Reconstructionism & "The Flat Earth Temptation"
An emergent scandal over a Texas Republican Party politician's distribution of a memo citing a "fixed Earth" website alleging the Earth does not not rotate and lies at the center of the universe has raised the question; where do such eccentric views as Rep. Chisum's, that the Copernican model of the Solar System is wrong and derives from a Jewish Kabbalistic Conspiracy, come from ? Until recently, it's been generally assumed that the debate over heliocentric vs. geocentric models of the universe, that raged up until the advent of Copernicus, had been well resolved. Lately though, an American movement has sought to restore the Earth to a central position in the grand cosmological scheme... Since the existence of the "Flat Earth Society" became a widely traveled joke, it has become hard to determine if card-carrying flat-earthers really exist any more; many join the society for amusement. Tom Willis wasn't the only geocentrist toiling away to reverse scientific theories that had been accepted for centuries. Indeed, geocentrists could be found in orbit, frolicking and also fighting with Copernicans, around a key ideological and theological gravitational center of the Christian right : the Chalcedon Foundation. 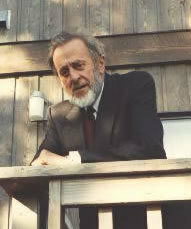 "The Tychonian Society was founded in Canada in 1971 by the late Dutch-Canadian educator, Walter van der Kamp (photo at right). The society was, and still is, a loose-knit, world-wide group of individuals from all walks of life. It's original purpose was to disseminate information about the central place occupied by the earth in the universe. To achieve that goal, Mr. van der Kamp produced The Bulletin of the Tychonian Society, thus founding the Tychonian Society. The Bulletin featured articles on the history, philosophy, and scientific arguments and evidence for geocentrism, the belief that the earth is located at rest at the center of the creation. In 1984 Walter van der Kamp retired as editor of the Bulletin and handed the reins to astronomy Ph.D., Dr. Gerardus D. Bouw..."
"Historians readily acknowledge that the Copernican Revolution [i.e., the idea that 'the earth moves and turns'] spawned the bloody French and Bolshevic revolutions... set the stage for the ancient Greek dogma of evolution...led to Marxism and Communism...It is reported that Marx even acknowledged his indebtedness to Copernicus, without whom Marx believed that his ideas would not have gained much acceptance...It is thus a small step to total rejection of the Bible and the precepts of morality and law taught therein." - Gerardus Bouw, Ph.D., "Why Geocentricity?" 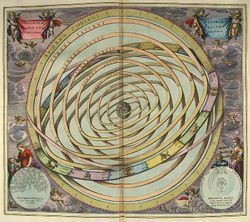 Gerardus Bouw's commentary seems to suggest teleological, or utilitarian, reasons for Geocentric belief ; world conflict of the last five hundred years or so is heaped on Copernicus, and the presumed solution is to turn back the clock and put the earth back at the center of things. From time to time, we have had occasion to comment on the Reconstructionists or, as they are sometimes called, theonomists (see "Why Wait for the Kingdom? The Theonomist Temptation," FT, May 1990). The most prominent figure in this movement that advocates the universal applicability of Old Testament law is R. J. Rushdoony, who publishes Chalcedon Report out of California. Reconstructionism, in various forms, is not without influence among activists and thinkers in "the religious right." The movement is famously fractious, and for years Rushdoony has been crossing swords with his prolific son-in-law Gary North over questions wondrously exotic. 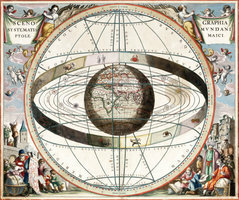 The latest battle is over "geocentrism," the doctrine that the earth is the physical center of the creation. Rushdoony is for it and North is against it. Apparently they are lining up astrophysicists and other scientists to help confirm their conflicting exegesis of Scripture. Is this ridiculous? Those who are truly liberated from political correctness might respond that there are a lot of less-interesting questions that might be debated, and all too often are. 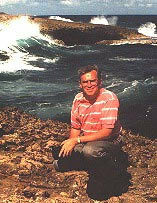 Martin G. Selbrede has a "Chalcedon Position Paper" in defense of geocentricism in the October 1994 Chalcedon Report, and readers who want to know more about this fast-exploding controversy can write him at 9205 Alabama Ave., Suite E, Chatsworth, CA 91311. If we understand the argument, which is doubtful, Einstein is solidly on the Rushdoony side. Galileo has not been heard from, and reports that Gary North is in contact with him remain unconfirmed. A cosmology which is this out of touch with modern astrophysics is far more of a tactical problem for Henry M. Morns and his natural science associates than it is for Christian Reconstruction, which concentrates on social theory and policy. A May, 1995 edition of Time Magazine, featuring Ralph Reed's face on the cover alongside a feature story titled "The Right Hand Of God" , described the successful effort that year, by Christian right activists and the Christian Coalition, to take political control of the US Congress and Senate; as Joan Bokaer of Theocracy Watch writes, "Out of forty-five new members in the U.S. House of Representatives and nine in the U.S. Senate in 1994, roughly half were Christian Coalition candidates".Though an entire firmament of Christian right think tanks and nonprofit organizations has been created since then, Time's story credited only one institution as a seminal theological influence on the movement that burst so unexpectedly ( to some ) and jarringly onto the national stage ; the Chalcedon Foundation. Chalcedon was --and may well still be --a hotbed of geocentricity. RJ Rushdoony, Chalcedon's very founder, seems to have been a geocentrist and the man Rushdoony tapped as his successor, Martin Selbrede, has emerged as a one of the leading theoreticians working doggedly to smack down the impudent Copernicus and restore the Earth to its rightful place at the center of the Universe and all creation. Selbrede, to his credit, isn't trying to hide his views - nor is he trying to make a show of them either. Here's what appears to be a comment of Selbrede's, quite eloquent, posted on a Catholic geocentrist's blog, on a recent book on Geocentrism, by Robert Sungenis and Robert Bennett, entitled "Galileo Was Wrong"
.....Just as the Chalcedon Foundation, a Protestant Christian educational institution, published the work of Notre Dame University's Prof. Edward J. Murphy due to the importance of his work, so it is fitting and right to extol this particular compendium for so clearly demonstrating that the emperor's wardrobe is not merely diaphanous, it's positively massless (or expressed more plainly, the emperor, modern science, is wearing no clothes). It is with pleasure that I remand this volume into the hands of the reader, whether he or she is an atheistic scoffer, a Roman Catholic inquirer, a Protestant polemicist, an Evangelical skeptic, or is otherwise motivated to re-open an issue heretofore thought, wrongly, to have been settled nearly four centuries ago. I would recommend approaching this work with as open a mind as you can muster. More importantly, I would urge the Christian reader to come to grips with our built-in, and very human, "lust for credibility", our desire to have "friendship with the world" and retain "the praise of man", all of which have sapped our resolve and lead to slippery-slope compromises that continue to lead men into the ditch. This is all the more remarkable, insofar as the present volume exposes the dark, seamy underside of modern science and its Janus-like propensity for speaking out of both sides of its mouth simultaneously. For the critic consulting the volume with the sole intent of attacking it, Drs. Sungenis and Bennett have provided the right thing indeed: a big, fat, juicy target. Therefore, let the debate begin in earnest. With documentation this thorough, the opposition can be quickly called on the carpet for misquotation or taking points out of context. Such interaction with hostile critics can only strengthen future editions of this work. If more Christians would raise the bar like these two authors have done, we would more readily perceive that the Word of God is an anvil that has worn out many hammers ... and will continue to do so. Chief Scientist, UniPixel Displays, Inc. They have been publicly promoting this theory since the mid-1970's. The Tychonian Society is one of the organizations that defends this cosmology. I prefer not to refer to this movement as geocentrism. They are geostationists. It is a movement with a unique theory of cosmic movement and immobility. When they say that the sun rises in the east and sets in the west, they really mean it. They insist that the galaxies of the universe literally revolve around the earth, one revolution per day. In a surprising turn of events, Dr. Gary North hired Dr. Michael Martin Nieto, theoretical physicist at Los Alamos National Laboratory, to analyze alleged fatal flaws and defects in geocentric cosmology from the standpoint of an astrophysicist. 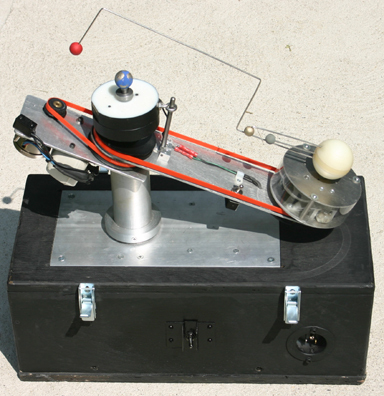 Dr. North paid Dr. Nieto for the resulting essay, entitled "Testing Ideas on Geostationary Satellites," which is incorporated as the bulk of the publication bearing the superscription, "Geocentrism: An Astrophysicist's Comments." Dr. Nieto interacted with virtually no relevant geocentric material, although it was not only available to Dr. North, but actually forwarded to him in 1992. Dr. North saw fit to return the most technically-oriented and complete videotaped lecture on geocentricity available at that time, without having ever watched it. The video provided up-to-date technical references in answer to Dr. North's many challenges, but he refused to view it. He could have saved himself the money, and Dr. Nieto the trouble, had he not inflicted such blindness upon himself. The response to Dr. Nieto is contained in that video, and we need merely rehearse it here to refute Dr. Nieto's and Dr. North's papers. The fact that Dr. North held that very video in his hands and yet refused to view it, reflects a tragic breakdown of academic and intellectual integrity on his part. The conflict was never really resolved, and North's attempt to beat down the growing geocentric intellectual insurgency has so far failed ; a doctrine that might have seemed laughable a century ago seems to be spreading and recently has popped up in at least one member of the Texas GOP. "You have a problem. You want to believe the Bible. You have also accepted the teachings of the "geostationicity" movement as almost the equivalent of the Gospel. If this movement is wrong, you fear, maybe the Bible is wrong. This is not the case; the movement is almost certainly wrong while the Bible is certainly true - just not a literal interpretation of a few passages." An emergent scandal over a Texas Republican Party politician's distribution of a memo citing a "fixed Earth" website alleging the Earth to be non-rotating and at the center of the universe has raised the question; where do such eccentric views as Rep. Chisum's, that the Copernican model of the Solar System is wrong and derives from a Jewish Kabbalistic Conspiracy, come from ? For anyone who's interested, Vince Liebowitz at Capitol Annex has posted a PDF of the memo in question. And for the compliment. I'd been sitting on this theme, w/writer's block, for maybe 2 years and people started nuzzling up to the territory so I thought I'd best write about it. I'm sure it will surprise no one that the geocentrists aren't the only anti-science nutters that have benefited from Chalcedon. For 20 years, one of Chalcedon's board members was Howard Ahmanson, a California S&L bigwig who also happens to be a Reconstructionist, and who gave almost three-quarters of a million dollars to Chalcedon over the years. When the whole "intelligent design" movement started gaining legs back in the early 90's, Ahmanson left Chalcedon, and donated $1.5 million to the Discovery Institute to establish the "Center for (the Renewal of) Science and Culture", which promptly became the leading "think tank" behind intelligent design "theory". Ahmanson now sits on the Discovery Institute's board of directors, and by some estimates he personally finances around one-third of the Center's anti-evolution campaign. "where do such eccentric views as Rep. Chisum's, that the Copernican model of the Solar System is wrong and derives from a Jewish Kabbalistic Conspiracy, come from ? " My limited understanding of that is that it is a belief system that thinks of seven spheres, increasingly out from earth (variations would be up/down/in some transcendental plane). Those tie to the seven observable heavenly objects so well illustrated in first graphic in this story. Each would have a gatekeeper/god/angel and you need the right "abracadabra"/answer/spell/successful test to do/say/act out, to get by. When Paul mentions being caught up into the third heaven, this is what he's talking about. Not saying Paul (the Apostle) was a Kabbalist but rather this old, old, old, old way of thinking is as older than Gilgamesh. I'd think that the Pharasis had some thinking along those lines. There were secret and sometimes not-secret-at-all but more as "folk thought" that does not get written down and therefore does not survive. Except for the lasting entertainment value of stories about Leprechauns and jinn, we wouldn't know about the beliefs -- we certainly don't have much record about the serious belief system around things that people just accepted and didn't tend to philosophize over (didn't write down). So, Rep. Chisum, WTF Dude? That Can help You To Find Best sattamatka Datefix Game For Kalyan and Main Mumbai Matka Games. I can't say the Copernican model of the Solar System is wrong and derives from a Jewish Kabbalistic Conspiracy, come from ? This planet is a mysterious place where we are living ...how we are living & why we are living these questions are tough to answer.